This entry was posted in Home Security, Locks and tagged Best Keys For Home Security, Home Locks, Residential Home Security Basics, Tips for Home on August 14, 2017 by Locksmith Sarasota. Many people encounter problems with locks that don’t involve the quality or performance of the locks themselves. When a door doesn’t lock properly, the issue may actually be related to another part of your home’s security system. When diagnosing problems with a lock, it’s critical to look at several factors aside from the lock itself. Locksmith Sarasota is constantly coming across security performance problems that have nothing to do with the lock. We want our readers to know how to diagnose these issues to avoid further damage and unnecessary repairs. It’s not uncommon for an apparent lock issue to actually be caused by another part of the door. Damaged keys, warped building materials, installation failures, and other mechanical issues could easily interfere with a lock’s performance. If a key becomes stuck in a lock or a piece of a key breaks off inside a lock, it can prevent the lock from engaging. A stuck key presents a significant security issue, so it’s imperative to seek a locksmith’s assistance as soon as possible. If you try to remove a stuck key yourself, only pull the key directly out from the lock. Do not twist it. Twisting the key when it is stuck makes it more likely to break. If the teeth of a key become worn or damaged, they may not strike the locking pins correctly and prevent the door from locking or unlocking. Some believe that applying lubricants to stuck locks will help keys turn easier. While this may be an effective short-term solution in some cases, bear in mind that lubricants will likely gum up the pins of the lock, rendering it useless over time. The lubricant will also accumulate dust and debris, further impairing the lock’s effectiveness. If you need to use lubricants to get a key to turn within a lock, plan to replace the entire lock soon. Wooden doors and frames may warp due to exposure if they are not properly treated for weather resistance. A warped door can prevent the lock from aligning with the door and the frame. Warping can also cause the strike plates on the door and the frame to bulge outward, possibly even preventing the door from closing properly. In these situations, fixing the warped door or frame, or moving the strike plates, may correct the problem. When doors stick closed, they can also cause locking problems. Fixing a stuck door usually requires rebuilding the door jamb, an extensive and time-consuming task, or trimming the door to fit the space properly. The latter option is generally easier and may answer your locking problems. If a door’s hinges dislodge, warp, rust or sustain damage, the door may not be able to close properly. An apparent lock issue may be a problem with the door’s hinges. In these cases, repairing or replacing the door hinges may correct the issue. When replacing hinges, it’s important to use screws that are about one inch longer than the ones in the old hinges. This will help them to seat in the old screw holes securely and provide a smoother door swing. Attempting to fill the screw holes with the same-sized screws will more than likely fail to hold up the door. Poorly fit replacement hinges will only cause the same issues, so be sure to invest in secure hinge screws so the repair lasts. Although these tips may help you quickly and accurately diagnose common locking issues, some lock problems require the help of professional locksmiths. 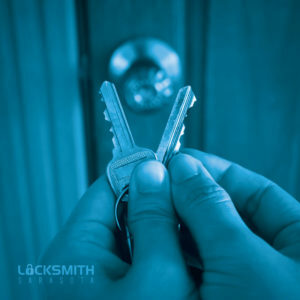 Contact Locksmith Sarasota if these tips can’t solve your locking problems or if you know the issue is more complex than a broken key, warped door or loose hinge. 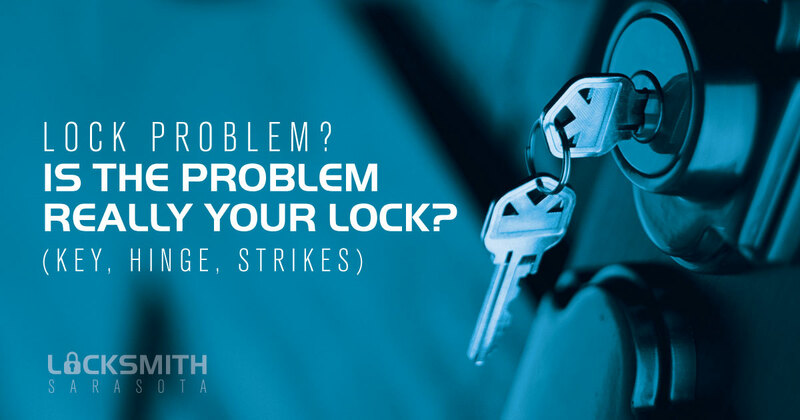 Even if your issue isn’t the result of a faulty lock, we can help you diagnose and address the problem. Reach out to us and you can rest assured that your home’s locks will soon be functioning as normal.